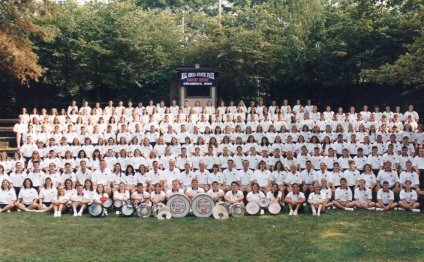 The All-Ohio State Fair Youth Choir (AOSFYC) was founded in 1963 by Glenville D. Thomas, who led the Youth Choir in concerts for thousands of visitors at the Ohio State Fair, directed them in a number of European tours and took them to several national parades. Championed by four-term governor James A. Rhodes, the Choir has sung for several gubernatorial inaugurations and was proclaimed Ohio’s “Singing Ambassadors of Goodwill” by the state legislature. Five days before the opening of the Ohio State Fair, the auditioned, 200-voice Choir meets at the Ohio Expo Center in Columbus and launches into a rigorous schedule that includes vocal training; sessions on vocal health; part, sectional and full rehearsals; solo auditions; and marching instruction. Once the Fair opens, the Youth Choir sings six to eight concerts a day, marching up to eight miles each day to various performance sites around the 360-acre fairgrounds. In addition to performing, AOSFYC members enjoy activities, headliner concerts and other special events at the Fair, build lifelong friendships in the Choir, and develop leadership skills that many choose to take back to the choirs in their own communities.